I spent a good part of this past weekend putting the finishing touches on this improv quilt for a co-worker. 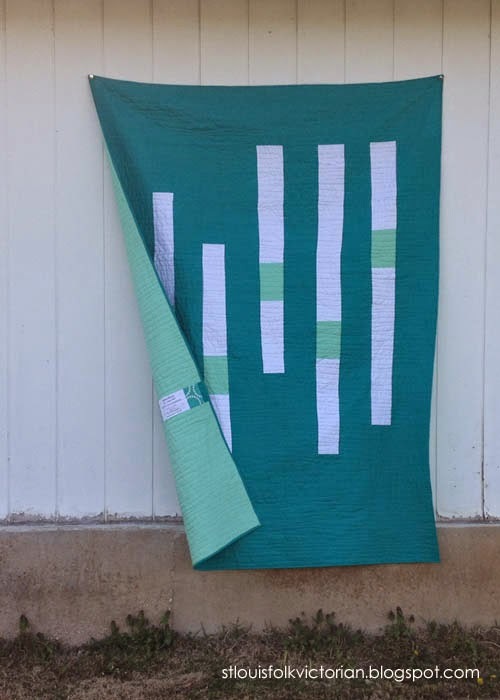 I was inspired by this crib-size quilt from Etsy. I really liked the concept of only using three colors and making imperfect shapes of varying widths. I pretty much threw the rules out the window in creating these shapes and played with uneven, mis-matched edges in order to achieve the look; which was quite a challenge and actually more work then if I would have done everything matchy-matchy. Yet, the final result was definitely worth the extra effort. 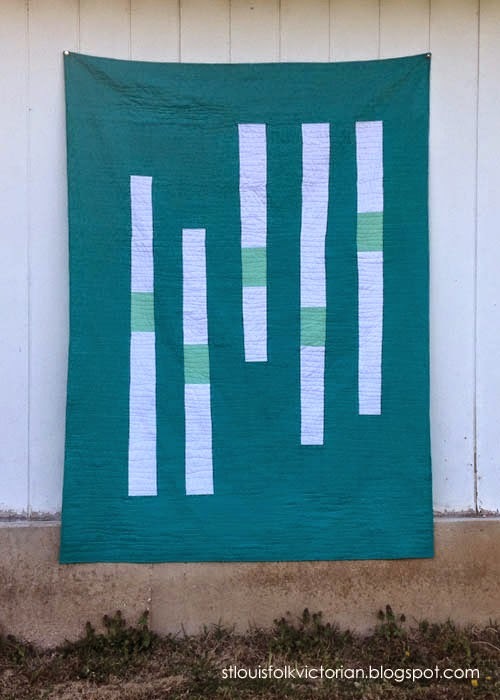 As my quilting lines would be fairly simple, just "organic" straight-lines running horizontally across the quilt, I wanted to add some interest in the thread color. I found a great shade of Gutermann variegated thread in shades of green/emerald. It is hard to see in the photos; but on the quilt, the variegated thread adds a whole other dimension that would not have been there had I chose to use a matching thread color. This is the second time that I have used variegated thread in one of my quilts [the first was STAR'D], and I really like the look. While the quilt's design lines are very vertical, the reason I chose to quilt horizontally was honestly because the thought of quilting super long lines of variegated thread vertically did not appeal to me...too much room for error, starting and stopping, etc. As for the fabrics, I only used three colors of Kona Cotton - Jade Green 1183, Pond 200 and White 1387. Jade Green makes up the majority of the front, while Pond is the focus of the back. The only other fabric addition was my label and just a hint of Pearl Bracelet from Lizzy House. One of the things that I love about working in an improv manner, is that I can change my mind at any time. While my original plan was going to look much more like the inspiration quilt; along the way, the shapes started dictating a different direction and I went with it. I am very pleased with the result and while this quilt is a gift for someone, there was a little part of me that actually wanted to keep it; but I can always make another, right? I used variegated thread in my last two quilts and really liked it. I was surprised how much, actually! This is a beautiful example of improv - really lovely! 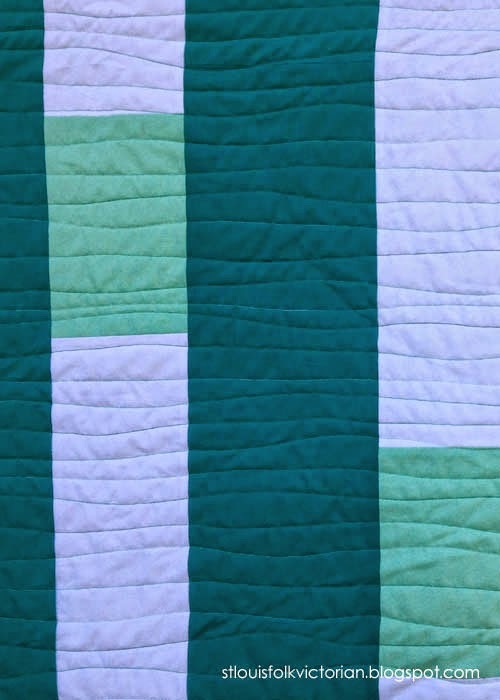 I really love your color and design choices for your quilt! Thanks for the link back to my Etsy shop--I really appreciate the mention! I like the shades on this and the simplicity and clean lines. Love it! Looks great and not surprised you want to make another one!